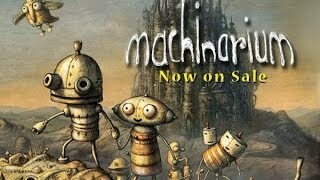 Machinarium on the Playism Store | Bringing a different breed of indie game to the world. An adventure game loved by fans all around the world. Award-winning independent puzzle / adventure game developed by the makers of popular web-games Samorost and Samorost2. Machinarium is the first full-length adventure game from Amanita Design in which players take on the role of a robot who has been exiled to the scrap heap. Players must use logic, collect important items, and solve environmental puzzles to get the robot back into the city of Machinarium so he can rescue his robot-girlfriend, save the head of the city, and defeat the bad guys from the Black Cap Brotherhood. With a brilliant musical score, gorgeous artwork, solid adventuring mechanics, and a ton of other generic positive reviewer comments I can heap on it, Machinarium is elevated from merely good to gaming greatness, and I can only hope that the minds at Amanita produce some more masterpieces like this one 90/100 . We poured all of our heart into this work. We believe that any players who spend time with this title will understand what makes it so special. How long is the full game in comparison with the demo? The demo is about 10% of the full game. The full game has 30 locations, many standalone puzzles and mini-games. The difficulty level of the puzzles rises slightly towards the end of the game. Is it possible to enlarge the game window to fit on my big screen? Unfortunately, no. You can only view the game in 100% mode (1250x790px) or 80% mode (1000x632px). The game run really slow sometimes. What should I do? Right-click (or Ctrl-click on a Mac) on the screen. Choose Settings. Click on the icon at the bottom left corner. Make sure that the hardware acceleration box is unchecked. Try running the game in window mode (fullscreen: off). I have lost my saved possessions after the restart. Why? If you have lost your saved slots in the full version of Machinarium, please "click here" for more infomation and advice. Please try right clicking Machinarium.exe, go to the Compatibility tab, check "Disable display scaling on high DPI settings". Please check the STEAM thread for more detail or solutions. What do you think about Machinarium?